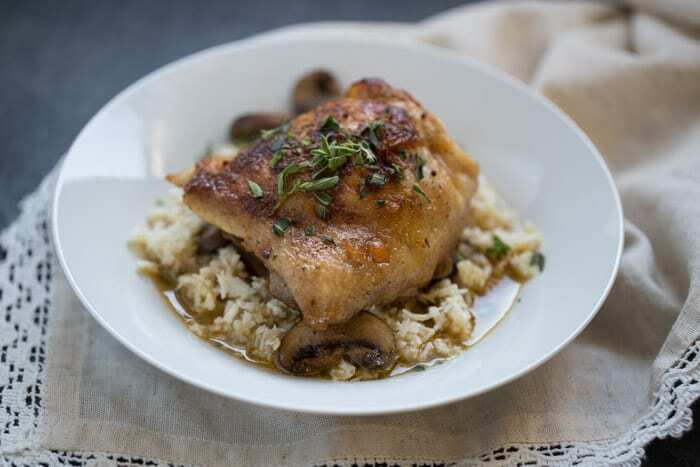 One Skillet Chicken Thighs and Mushrooms with Cauliflower Rice is an easy one skillet dinner recipe that’s ready to eat in under an hour. It’s low carb and gluten free and is made with real ingredients. What’s not to love? I adapted this recipe from I Breathe, I’m Hungry’s Skillet Chicken & Mushrooms recipe and I made these changes to the recipe: Added paprika to the spice mix; Used 1 cup of chicken broth in place of the water; Baked the chicken thighs instead of simmering them. This recipe starts on the stovetop and ends in the oven so I recommend using an oven-safe skillet so you don’t dirty additional cookware. A cast iron skillet is a great option because it goes safely from stovetop to oven. Once the meal is ready to serve, place the cauliflower rice in bowls or on plates. Top with mushrooms and juices from the skillet and then place the chicken on top. Sprinkle with fresh herbs for an extra pop of flavor! 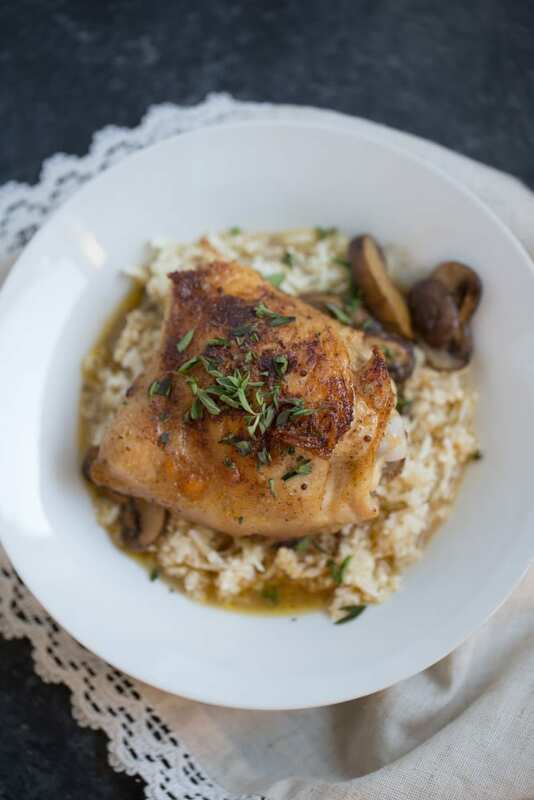 One Skillet Chicken Thighs and Mushrooms with Cauliflower Rice is an easy one skillet dinner recipe that’s ready to eat in under an hour. It’s low carb and gluten free and is made with real ingredients. Make the spice mix. Whisk together the kosher salt, paprika, onion powder, garlic and ground black pepper. Sprinkle the spice mix on both sides of chicken thighs. Melt 1 tbsp butter in a large cast iron skillet. Add the chicken thighs and cook 3-5 minutes per side or until each side is golden and crispy. Remove the chicken thighs from the pan and set aside. Add the remaining 1 tbsp of butter and sliced mushrooms to the skillet. Sauté mushrooms for about 3 minutes. Add chicken broth and mustard to the skillet and mix well. Return the chicken thighs to skillet and transfer the skillet to the oven. Bake 25 minutes or until the chicken thighs reach an internal temp of 165. Serve over cauliflower rice with the juices from the skillet and garnish with fresh oregano and thyme. Only serving two people? Save the leftovers and serve for lunch or dinner the following day. If you aren't low carbing it, feel free to use ½ C per serving of white or brown rice in place of the cauliflower rice. Ohh – those look so good I want to pick at them! Thanks for sharing on the What’s for Dinner link up and don’t forget to leave a comment at the party – Next week’s features that also leave a comment get pinned, yummed and tweeted! Yummy and low carb! I love it! Thank you for sharing at Tasty Tuesdays! Your dish looks delicious. I like replacing the rice with cauliflower. I agree, chicken and mushroom is a great combo. Thank you, Swathi! Love the idea of using cauliflower rice. One pot/skillet meals are such a life saver. I agree, one pot meals are a life saver! Thank you for stopping by, Sandhya! Such a simple recipe…I love it! Sometimes I get so sick of reading recipes where I have to kill myself prep wise..this one looks so easy and simple! Thanks for posting a simple and fabulous recipe!! Ah, I know what you mean! When I’m cooking dinner after work and I see a recipe that requires a ton of work to prep it, I’m like UGGGGGHHH! Thank you for stopping by, Amanda! This sounds and looks delicious and is yet another way, I’d actually eat cauliflower! :) Looks great! wow, This is looking really healthy and tasty recipe. Love this idea. Chicken recipes are my favourite all the time. Thank you. YUM! pinning this so I can get it on my menu next month. Thanks for sharing with us at Turn It Up Tuesday :) just pinned! Looks excellent! I’m always looking for new chicken recipes. Thanks for sharing. Stopping by from Friendship friday. Hope you have a great weekend! Looks good! Thanks for joining us at the Inspiration Spotlight party. Shared. This looks delicious. It also has an elegant look to it as well.